A loss is an adverse external event which a person has no control over and changes one's belief system and cognitions. Normal grief is a normal reaction to loss and refers to the distress resulting from bereavement. However, complicated grief is a syndrome where normal grief is unusually prolonged because of complications in the natural healing process; namely the insufficient integration of a new situation into pre-existing cognitive structures and distorted beliefs during the grieving process. Complicated Grief is a disorder characterised by an inability to accept the death, intense yearning, avoidance, somatic distress, social withdrawal and suicidal ideation and has a distinct cluster of symptoms which can be distinguished from other psychiatric disorders. The aims of this review are to give an overview of abnormal forms of grief reactions and risk factors, to introduce proposed diagnos-tic criteria for complicated grief, to inform about the assessment tools, and to demonstrate the distinction between complicated grief and other psychiatric disorders. Kayıp, üzerinde kontrol sahibi olunamayan bireylerin inanç sistemlerinin ve algılayış biçimlerinin değişmesine sebep olan olumsuz bir olaydır. Normal yas kayba karşı verilen normal bir tepki olup, kederden kaynaklanan sıkıntıyı ifade eder. Komplike yas ise, yeni durumun var olan bilişsel yapıya yeterince entegre edilememesi ve yas tutma sürecindeki çarpıtılmış inançlar gibi bireyin iyileşme sürecinde ortaya çıkan komplikasyonlar nedeniyle yas sürecinin alışılmadık şekilde uzadığı bir send-romdur. Komplike yas ölümün gerçekliğini kabul edememe, yoğun özlem duyma, kaçınma davranışı, bedensel sıkıntı, sosyal geri çekilme ve intihar düşüncesiyle karakterize edilebilen ve diğer psikolojik rahatsızlıklardan ayırt edilebilen bir sendromdur. Bu derlemenin amacı normal dışı yas tepkileri ve risk faktörleri hakkında genel bir bakış sağlamak, komplike yas için önerilen tanı ölçütlerini tanıtmak, değerlendirme araçları hakkında bilgi vermek ve komplike yas ile diğer psikiyatrik bozukluklar arasın-daki ayrımı göstermektir. complicated, prolonged, pathological, traumatic, grief, bereavement. Allumbaugh DL, Hoyt WT (1999) Effectiveness of grief therapy: a meta-analysis. J Couns Psychol, 46:370-380. Bildik T (2013) Ölüm, kayıp, yas ve patolojik yas. Ege Tıp Dergisi, 52:223-229. Boelen P A, Van Den Hout MA,Van Den Bout J (2006) A cognitive-behavioral conceptualization of complicated grief. Clin Psychol, 13:109-128. Bryant RA (2012) Grief as a psychiatric disorder. Br J Psychiatry, 201:9-10. Bryant RA (2013) Is pathological grief lasting more than 12 months grief or depression? Curr Opin Psychiatry, 26:41-46. Eisma MC, Boelen PA, Bout JVD, Stroebe W, Schut HAW, Lancee J et al. (2015) Internet-based exposure and behavioral activation for complicated grief and rumination: a randomized controlled trial. Behav Ther, 46:729-748. Enez Ö (2017) Effectiveness of psychotherapy-based interventions for complicated grief: a systematic review. 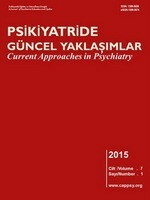 Psikiyatride Guncel Yaklasimlar-Current Approaches in Psychiatry, 9:441-463. Hospice Support Fund (2017) Complicated Grief. Merrifield, VA, The Hospice Support Fund. Groot M, Kejiser J, Neeleman J, Kerkhof A, Nolen W, Burger H (2007) Cognitive behaviour therapy to prevent complicated grief among relatives and spouses bereaved by suicide: cluster randomised controlled trial. BMJ, 334:994. Jordan AH, Litz BT (2014) Prolonged grief disorder: diagnostic, assessment, and treatment considerations. Prof Psychol Res Pr, 45:180-187. Kersting A, Brähler E, Glaesmer H, Wagner B (2011) Prevalence of complicated grief in a representative population-based sample. J Affect Disord, 131:339-343. Koon OE, Neo P (2016) Complicated grief: an introduction to current literature and management strategies in home hospice care. Nurs Palliat Care, 1: doi:10.15761/NPC.1000135. Kristjanson L, Lobb E, Aoun S, Monterosso L (2006) A Systematic Review of the Literature on Complicated Grief. Canberra, Australian Department of Health and Ageing. Maercker A, Lalor J (2012) Diagnostic and clinical considerations in prolonged grief disorder. Dialogues Clin Neurosci, 14:167-176. Malkinson R (2001) Cognitive behavioral therapy of grief: a review and application. Res Soc Work Pract, 11:671-698. Miller MD (2012) Complicated grief in late life. Dialogues Clin Neurosci, 14:195-202. Moayedoddin B, Markowitz JC (2015) Abnormal grief: should we consider a more patient-centered approach? Am J Psychother, 69:361-378. Ogrodniczuk JS, Piper WE (2003) Recognizing complicated grief in clinical practice. Can J Psychiatry, 48:713. Papa A, Rummel C, Garrison-Diehn C, Sewell MT (2013) Behavioral activation for pathological grief Death Stud, 37:913-936. Papa A, Sewell MT, Garrison-Diehn C, Rummel C (2013) A randomized open trial assessing the feasibility of behavioral activation for pathological grief responding. Behav Ther, 44:639-650. Penman EL, Breen LJ, Hewitt LY, Prigerson HG (2014) Public attitudes about normal and pathological grief. Death Stud, 38:510-516. Range LM, Kovac SH, Marion MS (2000) Does writing about the bereavement lessen grief following sudden, unintentional death? Death Stud, 24:115-134. Robinaugh DJ, Marques L, Bui E, Simon NM (2012) Recognizing and treating complicated grief. Curr Psychiatry, 11(8):30-35. Rosner R, Pfoh G, Kotoucova M (2011) Treatment of complicated grief. Eur J Psychotraumatol, 2:10.3402/ejpt.v2i0.7995. Sayıl SÇI (2003) Patolojik yas kavramına yeni bir yaklaşım: travmatik yas. Kriz Dergisi, 11:29-34. Shear K, Frank E, Houck PR, Reynolds CF ( 2005) Treatment of complicated grief: a randomized controlled trial. JAMA, 293:2601-2608. Shear M K, Ghesquiere A,Glickman K (2013) Bereavement and complicated grief. Curr Psychiatry Rep, 15:406. Shear M K, Simon N, Wall M, Zisook S, Neimeyer R, Duan N et al. (2011) Complicated grief and related bereavement issues for DSM-5. Depress Anxiety, 28:103-117. Shear MK, Smith-Caroff K (2002) Traumatic loss and the syndrome of complicated grief. PTSD Research Quarterly, 13(1):1-4. Simon N M (2013) Treating complicated grief. JAMA, 310:416-423. Supiano KP, Luptak M (2013) Complicated grief in older adults: a randomized controlled trial of complicated grief group therapy. Gerontologist, 54:840–856. Wakefield JC (2012) Should prolonged grief be reclassified as a mental disorder in DSM-5? : reconsidering the empirical and conceptual arguments for complicated grief disorder. J Nerv Ment Dis, 200:499-511. Worden W (1991) Grief Counselling and Grief Therapy a Handbook for the Mental Health Practitioner. London, Routledge. Zachar P (2015) Grief, depression, and the DSM-5: a review and reflections upon the debate. Revista Latinoamericana de Psicopatologia Fundamental, 18:540-550.